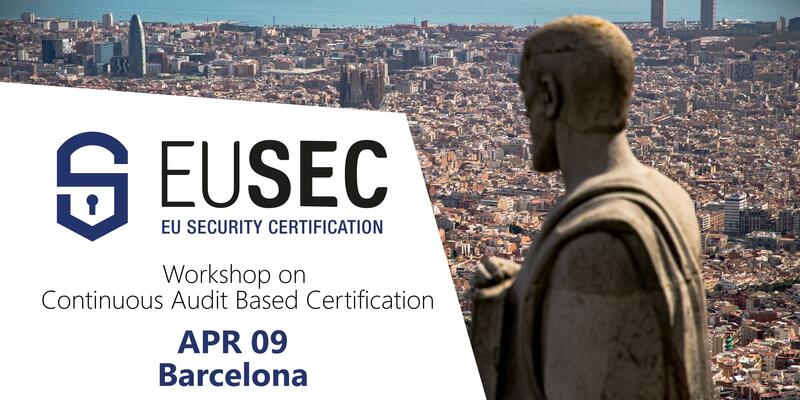 Together with its partners in the EU-SEC project, Fraunhofer FOKUS is organizing a workshop on "Continuous Auditing Based Certification" on April 9th, 2019 in Barcelona. The event will focus on the EU-SEC approach for the introduction of a certification scheme for cloud services based on continuous auditing. The workshop is aimed at interested individuals who either already have experience in providing secure cloud services or would like to gain this experience. In addition to a general introduction to the EU-SEC project, the scientists will provide a deeper insight into the concept of Continuous Auditing. In a hands-on session, participants of the workshop will then be allowed to test the pilot architecture modules and their functions for end users and auditors. The workshop is free of charge. However, as the number of participants is limited, a registration in advance is necessary.